An employment agency contract exists if an employment agent obtains a worker to provide services to a client in return for a fee. Under this arrangement, the worker does not become an employee of the client. 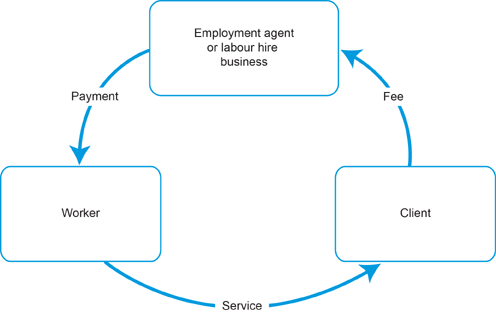 The diagram below demonstrates how an employment agent arrangement works. Note: An employment agency is different from a recruitment agency arrangement. See the public ruling about recruitment agencies (PTA029) for more information. Recent audits have found that some labour hire payroll processers are not passing on tax paid to them by employers. Find out more about how a labour hire arrangement can affect your payroll tax. An employment agent is considered the employer of the worker providing services to the employment agent's client under an employment agency contract. The worker is deemed to be the employee of the employment agent. Amounts the agent pays under the employment agency contract, including fringe benefits and superannuation contributions, are taken to be wages. The employment agent as an employer is liable for payroll tax on wages they pay the worker directly or indirectly. fees the client pays the agent.